It’s a bit hard to see from this picture, but the screw is actually partially melted. This happened when Sofia pulled her computer’s A/C adapter out of the wall, which resulted in a large spark, and that circuit blowing, leaving her in the dark. I think this one is not actually the fault of the last owner of the house (who I won’t name, and who did lots of dangerous wiring), but was due to the effects of time, and a slightly lazy electrician. 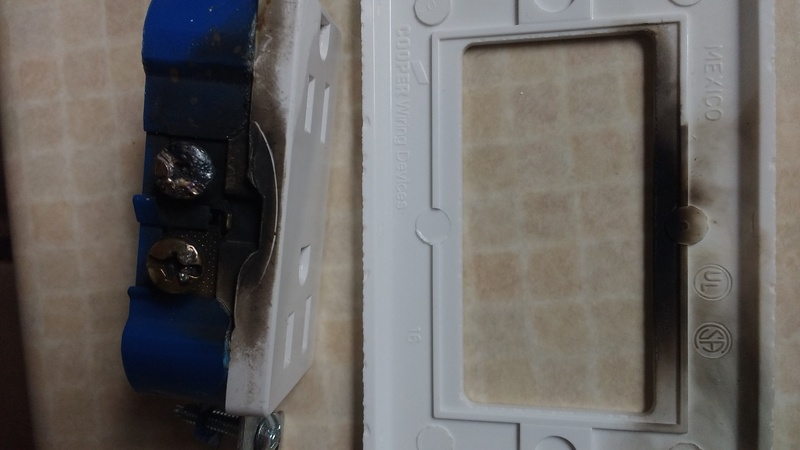 The electrical box is slightly deformed pushing it on the right towards the hot screws of the outlet, and the outlet was wired up with the “quick wire” method, with the wires plugged directly into the back of the outlet, not using the screws on the sides. Unfortunately, the hot screws were left sticking out fully (although the neutrals were screwed in nice and tight). In the thirty years since the house was built, I think the outlet loosened enough that the furthest out hot screw touched the outlet box when the outlet was moved slightly pulling out the cord. This shorted it nicely (scaring the hell out of Sofia), and toasting the outlet nicely. Needless to say, I did not try to recycle this one, and it’s going in the trash. There’s another loose outlet on the first floor that I’ve been meaning to fix. I’m definitely going to get that opened up soon, and tighten it up — seeing the giant scorch marks on this one really highlights how dangerous that could be.